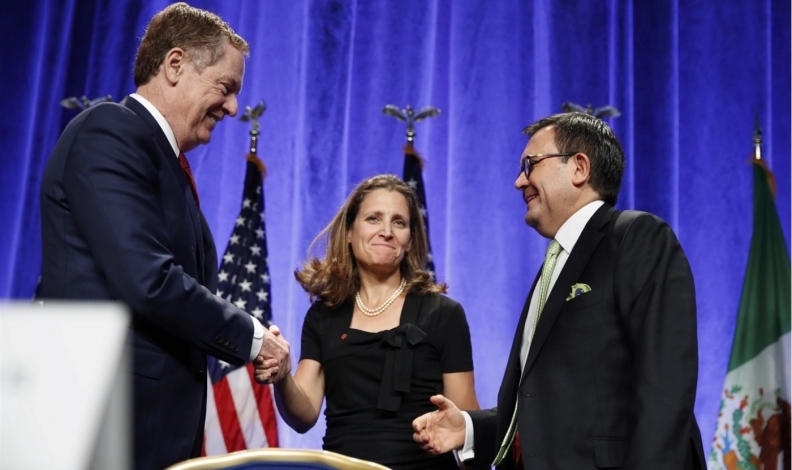 U.S. Trade Representative Robert Lighthizer, left, shakes hands with Canadian Foreign Affairs Minister Chrystia Freeland, accompanied by Mexico's Secretary of Economy Ildefonso Guajardo Villarreal, after they spoke at a news conference back in August. The trio met in Ottawa to talk NAFTA this week. OTTAWA - The third round of talks to renegotiate the North American Free Trade Agreement was coming to a close Wednesday with the spectre of a U.S. withdrawal by President Donald Trump growing ever larger, thanks to stalled progress on major issues. The slow pace of the Round 3 talks is being widely blamed on the lack of concrete proposals being brought by the United States — fuelled by internal U.S. divisions — but there are grumblings about a lacklustre showing by some Canadian negotiators. That is stoking broader fears that an impatient Trump could trigger NAFTA's withdrawal clause if he doesn't see a win for the United States by the end of the year. Canadian Foreign Affairs Minister Chrystia Freeland held separate meetings with her U.S. and Mexican counterparts before she and U.S. Trade Representative U.S. Robert Lighthizer and Mexican Economy Minister Ildefonso Guajardo had their final joint talk. A rift emerged Tuesday with unions saying Canada was facing opposition from the United States and Mexico on its proposal to raise labour standards — targeting what are seen as anti-union practices in more than two dozen U.S. states and improving the plight of Mexican workers. Mexico is deeply worried about the possibility of Trump making a move to unilaterally withdraw from NAFTA, said Moises Kalach, a leading member of the private-sector group that advises the Mexican government on the negotiations. "We take it very seriously. He is the president of the United States," Kalach said in an interview. Like Canada, Mexico has mounted its own full-court press on various levels of U.S. government and business. Kalach cited 200 stakeholder meetings in the U.S. and meetings with 22 state governors. Mexican business leaders also planned meetings with 20 Canadian businesses and associations this week. The overarching takeaway from all of that consulting, said Kalach, is this: most are on a different page than Trump and see NAFTA as essential. "We're almost 100 per cent aligned in the private sector sometimes, even with the governments of Mexico and Canada," said Kalach. Most companies don't agree with Trump's threats to NAFTA's Chapter 19 dispute resolution process, he said. "It seems like the only voice out there that does not agree with some of the things we've been doing is President Trump and his team. So yes, we're worried about withdrawal and we're lobbying strongly on that." Peter Clark, an Ottawa-based international trade strategist who was involved in the NAFTA and Canada-U.S. free trade negotiations, said the U.S. negotiators are mainly responsible for the foot dragging, but it's unclear if that's a deliberate strategy of a manifestation of internal American divisions. "They're getting a lot of pushback from Congress on some of the positions they want to take," said Clark. The delays don't auger well for the fourth round of talks in Washington, he added: "I understand it's beside the Pentagon so there may be fireworks."